Out of Order watch will trick your friends. Design Submitted by Heather (USA) & Sam (Germany). To give the look a more analog feel, and less digital, they decided upon an e-paper display. This also allows for the user to have background options of black or white, different font choices and background patterns. The hands are real, and not part of the e-paper display. They are designed to show up well on either a black or a white background, and have mechanical movement. The second hand moves clockwise and keeps accurate analog seconds, and the minute hand moves backwards at ten times the speed to make you feel like you’re in the Twilight Zone or the Bermuda Triangle. The hour hand stays fixed at the 7 hour position, reminding the user how to read the time: the numbers in the bottom three positions on the display tell the time digitally, starting with the hour in the 7h position. When the minute changes, all of the numbers in the other positions are randomly rearranged, giving the name “Out of Order” a double meaning; the watch seems to be malfunctioning, and the numbers are all out of order. Anyone, male or female, with a good sense of humor would love to wear this design. If you like when people ask you how to read your watch, this one makes a very good conversation piece. And the time-telling is ridiculously easy for something that looks so absurd at first glance. There are no other “digital that looks analog” watches out there, and this wacky functionality is epic. 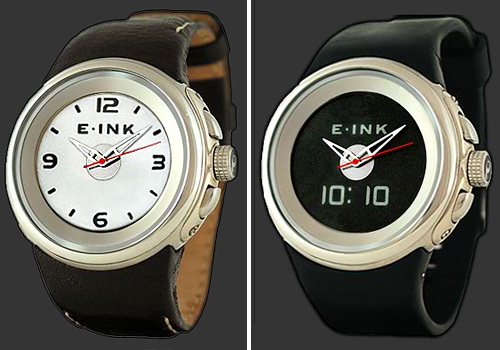 This entry was posted in Design Submissions, Watch Designs and tagged broken, Concept Watch Design, LCD Watch, out of order, trick, Watch Design Submission. Bookmark the permalink. ← Sequence watch is both simple & complex. Another cool coop from Sam and Heather, very simple but very effective idea. Classic styling with a criptic display which is very simple when you know where to look! Loving the anodised blue! 5 stars and of course Yes! Thanks, Pete! So far, everyone of my friends and family that I showed this to wants to get one, including my mom! I would so love to walk around with a watch on my wrist with the minute hand moving around backwards and way too quickly! 😀 WHAT?! Thank you for your feedback Peter!! This is fantastic. I want one of these. Naw, you get an A. Thank you B! Love it! nice idea :D, but how would you make the numbers appear? LCD perhaps. Thank you Charles. Heather said it all 🙂 With e-paper we have pretty much freedom. This is freakin cool and so Thinkgeek.com, my only issue is, how do I relate it with Tokyoflash? But Sam & Heather sounds more normal than Sam & Peter. Voted. ^ Ranjan and Gordon, thank you both! I like the idea for all the reasons you mentioned and some others of my own! It is a really cool concept but to tell you the truth it is so freaking complicated to produce… You basically have two watches crammed into one slim design with two completely different technologies and an analog movement that nobody is making at this point. I also am not aware if it’s even possible to cut a hole in e-paper. Your thinking is out of the box and really creative so I hope your concept is feasible because I would like to buy one for my girlfriend. Congrats! Hi qntt! First of all thanks for your feedback, very nice. We googled around about the usage of e-paper in watches. There is one example of an analog watch with a (rather boring) e-paper display. I would really like to see this on the market. If the price is right, I should buy more than just one. It’s awesome! Love it! I would like to Pre-Order! I want one, I think its a superb design and great idea! This watch is the embodiement of everything I want in a watch, it’s weird, funny and easy to read design that will surely make all my friends heads turn. Absolutely 100% LOVE this watch! The idea of it is amazing, the design is also so perfect! I am just about to buy my first watch from Tokyo flash, kind of gutted that it is not this one! I want this watch. This one would also make a great pocket watch. This is brilliant. Bizarro watch confuses all who see it, except the owner of the thing! 5/y soooo much! ^ Thank you all above 😀 Very encouraging! What do you think of the display Jun? It was very difficult to choose, but I did it! I like the black one! And 5* + Y for you! Or silver, or blue, or red? Whatever! Put me down for one . I love it. sorry, this one just isn’t for me. imho one of the things that make TF watches great, is the fact they are different. people saying “wow what’s that on your wrist” is part of the fun. with this desing though…..most people will just think it’s a normal watch at first glance. so rather than saying “wow” they will just shrug. the only person that will know it’s different, is the wearer. i think it’s very creative, and it looks good….just not for me. just watched the hand movement video, and i think i changed my mind a little. i didn’t realize how fast the minute hand would be going. at that speed, it WOULD probably make people look twice. Thank you for your feedback diclonius! Nice to see your experience with this watch. Yeah, the wow-effect was hidden in a normal looking watch this time. It’s like a wolf in sheep’s clothing. Can go anywhere (!) but will make the other sheeps loose their wool, hehehe. I like the base idea, but the execution is.. Dull? If you’re going to make a messed up watch; Go all out, nick the face from a Dali, and make the band out of swiss chesse or somesuch. Paint the face with Moon-rock pigment! I understand what you were going for, but I can’t say i’d buy it. There is a nice idea at the heart of it, and could really shine with a more radical approach. It’s a good idea very original and fun. This is an absolute must-have for me! Please make this watch a reality. I do not agree with those who say it’s not strange or crazy enough. Its deceptively normal look does just that — it decieves you until you take a closer look, and that’s when it gets crazy. Dali watches may be cool, but that’s been done before. This is the only right execution. I like the costomizability, and if I had one I would probably choose the most “normal” looking face for excactly the reasons above. I just used dali as an example, wasn’t saying it would work for this watch. looking normal until you get close works against it for me, the point of TokyoFlash is you have a watch that looks cool and different from a distance.. With this, only the person wearing it will know it’s anything other than a normal watch for the most part. Must have missed that, thanks. It’s not really changed my mind though, i’d probably see it from across the room, but none of my friends/family would really notice something like that unless it was in front of them. As a magician I have to say, that woulf perfectly fit into my repertoir of extra-ordinary illusions! One of the best concepts I saw so far! I think the concept is interesting, makes me think of the mad hatter’s tea party, but I think you could have taken the concept further and made the digits look wacky too. Nice case and band. I want to BUY this model, if it’s selling. Great! Thank you for your nice comment! I own a “the one” watch and now want something plain and simple but different. I love this watch! It doesn’t hurt my brain so much as counting dots and bars. I hope it is available soon. This is amazing, I want one. Thank you Pete and all supporters up there! Heather and I knew cause it’s not flashing and screaming it won’t please everyone. It’s an “oh I can tell the time on tha…eh what the fork?” watch. It’s another approach and we’re glad it got shown on here. It seems it’s mostly accepted. Let’s hope we can trust this tendency. Stay critic, stay honest, stay tuned! I love the concept. I love the look. I would definitely buy this watch. I think it’s a nice touch that the hour hand doesn’t “work”, but in fact is always pointing toward the correct hour. I am curious, though, how would a time that has a minutes value that is a multiple of 10 be displayed? For example, 5:39 displays a “5” a “3” and a “9”, but would 5:40 display a “5” a “4” and a “0”? Also, would 4:44 have three “4”s at the bottom? I can see that, most of the time, the display would appear as if the normal numbers were on the face, but randomly placed, but in the case of a single digit appearing multiple times in the current time, or a “0” occurring in the current time, this illusion would be dispelled to some degree. Just wondering how this watch would display those types of times. Actually, it would be sort of neat for times when all of the digits would be the same (such as “2:22” or “3:33”) to turn ALL of the digits into the same thing (for that one minute period). That’s just my two cents. Awesome watch design! Yep, the 2:20 is an example and also the 2:44. It could be, the illusion gets destroyed earlier with such times. “Well thats a normal… wait a sec, two times the 4?” Hehehe, still a funny experience. I like the “all numbers the same” idea, when there are “three in a row” times. It could also be alternating fun at times like 2:32. The watch might look normal at first, but we can see, there is enough fun hidden in it just because of that. Sam, Heather – Well done, this is pretty impressive. The second surprise is it’s actually easier than the analogue watch it pretends to be. I agree with Heather. Thank you for telling!! Wow, I really hope to be able to buy this watch soon, it’s really cool!! Where and when can I order it? This watch is amazing. I love the idea and my friends will be jealous! I want one of these!!!!! Best watch I’ve seen on the blog over the last year, really love the brighter strap colours too. I’m only getting one watch this year (after splashing out on too many last) and this would be it! Sign me up for the blue one! It’s everything I want in a watch! -unreadble by others, yet very easy to read by those in the know. I’ve been watching this sight for over a year and I am yet to see a watch that floats my boat. This one does! i will buy multiple watches of this version if you make it. IT IS THE COOLEST WATCH I HAVE SEEN ON THIS BLOG!!! Hello Scott and Kristina! Thank you both for your kind comments! Yeah, there has been a delay between rate-ability and comment-ability. So cool, this concept got recieved that well. Thank you Pete! Thanks to all above! It’s nice you shared your opinons with us!